The brilliant sparkle of this icy blue trillion-cut aquamarine and diamond ring is sure to please! 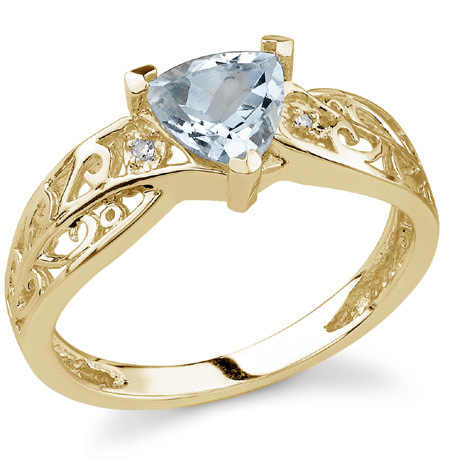 The 14k yellow gold ring is home to a 6mm x 6mm A rated aquamarine stone, with a small diamond on each side, totaling 0.01 carats and rated H-1 for color and SI for clarity. The trillion-cut stone makes this stone a favorite for all occasions. The lovely lattice-like scrollwork on the band of the ring adds extra personality to this beautiful piece of jewelry from Apples of Gold Jewelry. We guarantee our Trillion-Cut Aquamarine Ring with Diamonds in 14K Yellow Gold to be high quality, authentic jewelry, as described above.